Former president Robert Mugabe must approach the courts of law if he believes President Emmerson Mnangagwa's Administration lacks constitutional legitimacy, Presidential Spokesperson George Charamba has said. Last week, former President Mr Mugabe told journalists that the new Government was illegitimate, and that a meeting between him and his successor would restore constitutional order. However, in an interview yesterday, Mr Charamba told The Sunday Mail that it was absurd for Mr Mugabe to place himself above the entire State and polity, and arrogate power to bestow legitimacy. In addition, legal experts also trashed Mr Mugabe's claims that he was removed via a military coup last November, pointing out that he had signed his own resignation letter. This comes as more details emerge about Mr Mugabe's last days, what prompted the military to effect "Operation Restore Legacy", and what convinced the former President to call it quits. Yesterday Mr Charamba said, "The former President has asked for a meeting with President ED to cleanse what he calls an unconstitutional order. "Well, far be it from me to prevent any meeting between the President and any Zimbabwean, least of all his former boss. "However, looking at it from a commonsensical point of view, I can't see how an order which is allegedly unconstitutional gets cleansed by a meeting of two individuals over a cup of coffee. "That is to assume that the two, in the sum, constitute the State and the two define constitutionalism. "Is this not really an issue that he (Mr Mugabe) should take to the courts for them to determine? But as I said, this is just me." Lawyers who spoke to The Sunday Mail said Mr Mugabe's departure from office was wholly legal. Law Society of Zimbabwe president Mr Misheck Hogwe said, "Mugabe's statements have no legal basis. He does not supersede the Constitution. "The old man resigned and according to the laws of the country, the ruling party has to replace the President as we witnessed by the elevation of President Mnangagwa. "The fact that President Mnangagwa was sworn in by the Chief Justice, who was appointed by Mugabe himself, makes the former President's statements worthless. "His statements are coming from a disgruntled person who should not be taken seriously. There is no other way the President can be legitimised other than by what happened." Continued Mr Hogwe; "I don't know why he wants to engage with the President because the President is legitimate according to the laws of the country and he has been accepted both locally and internationally." Lawyer and Zanu-PF Secretary for Legal Affairs Mr Munyaradzi Paul Mangwana weighed in: "Due to old age, the former President might have forgotten that the national Constitution he signed has a provision for impeachment of a President. "That process was underway when he finally tendered his resignation and the pressure of the constitutional process forced him to resign. "Zimbabweans must forgive the old man. Maybe due to his advanced age he has forgotten that he willingly tendered his resignation to the Speaker of Parliament. "History has to be written correctly; all due constitutional process was followed. After Congress recalled him as First Secretary and President of Zanu-PF, the same party initiated impeachment processes through party Chief Whip Lovemore Matuke." Another lawyer, speaking on condition of anonymity, said "a coup by definition is a sudden and violent takeover of Government and that did not happen as all systems of Government remained functional". "Section 212 of the Constitution provides that the Zimbabwe Defence Forces are the last line defence of the Constitution," he added. "And where there is a dispute over legality, isn't the cure approaching the courts? He should approach the Constitutional Court if he has a legitimate claim of a coup. Right now he is implying that a bilateral meeting is larger and above an election or a court." A source close to what was happening as Mr Mugabe's regime crumbled said the Command Element of the ZDF had to the very end placed the Constitution at the centre of all its decision-making. This included rejecting a bizarre request Mr Mugabe said for then ZDF Commander, General Constantino Chiwenga, to succeed him as President of Zimbabwe. "Mugabe and Grace were following proceedings on TV, seeing the huge crowds in the streets that were demanding he step down immediately, and his wife in particular was afraid that (Ambassador Christopher) Mutsvangwa and incensed university students would soon storm Blue Roof (the Mugabes' residence). "Zanu-PF had started a process to recall Mugabe and there was bipartisan support in Parliament for impeachment. "There was real panic at Blue Roof, and Mugabe sent an emissary (name withheld) to General Chiwenga with two strange requests. The first was that Mugabe wanted Chiwenga to be President, and the second was that when he dies, he does not want to be buried at the Heroes Acre. "General Chiwenga told (the envoy) that the leadership question was for political parties to decide and his concern was the Constitution and national security. "He said 'changu kupfeka makwapamakwapa' ('I am a uniformed soldier'). As for where you bury each other, that has nothing to do with the military." The insider said the military's respect for constitutional order was also apparent at the November 16, 2017 meeting between Mr Mugabe and a South African delegation sent by then President Jacob Zuma. "Mugabe invited General Chiwenga to that meeting, and he came with VaElson Moyo (then Air Vice-Marshal, now Air Marshal). Also present were South Africa's Minister of Defence (Nosiviwe Mapisa-Nqakula), their State Security Minister (Bongani Bongo), and others from both countries. "As soon as General Chiwenga stepped in, he walked directly to Mugabe and saluted him before taking his seat. Is that how a coup happens? That single gesture moved the lady (Minister Mapisa-Nqakula) so much. "She almost cried at the level of respect, even in such tense times and said from the way people were talking, she never expected to see the general respecting Mugabe like that. She said it means Zimbabwe has many lessons to teach Sadc. "Right up to the day Mugabe resigned, the commanders maintained respect for their then Commander-in-Chief even as he tried to protect a criminal cabal." 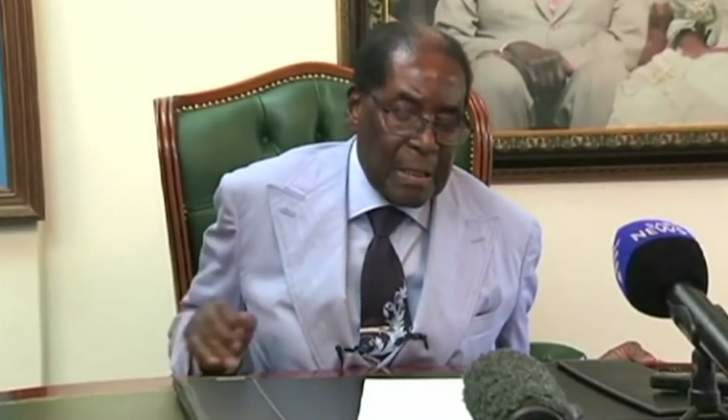 He said a mediation team – comprising Roman Catholic cleric Father Fidelis Mukonori, Central Intelligence Organisation Deputy Director Mr Aaron Nhepera, and Mr Charamba – pleaded with Mr Mugabe to accept that he had lost long lost control and that the popular uprising could descend into chaos if he remained recalcitrant. "Two messages were conveyed to Mugabe. One was that the street demonstrations were escalating and people were mobilising themselves to go to Blue Roof. The ZDF made it clear that if that happened, they were not prepared to order troops to open fire on civilians. In fact, a disgruntled State House worker had led a group right up to the final (security) checkpoint before Blue Roof and the military moved quickly to convince people to keep their demonstrations away from that house. "The second message was that the ZDF would not in any way interfere with an impeachment process because that would be in breach of the Constitution. "Mugabe said, 'So it means they (the military) are no longer ready to defend me? They are opening the floodgates.' Even as Mugabe vainly sent (name withheld) to try and divide MPs and the Speaker of the House to stop them from impeaching him, he was raging at (then State Security Minister Kembo) Mohadi and (then Defence Minister Dr Sydney) Sekeramayi for not using State apparatus to quell the uprising. "It took him a while to appreciate that this was very much a social revolution and that the national security organs would not act unconstitutionally just to protect his position as Head of State. He came around slowly, which is why you hear in his 'asante sana' speech the concession that while he did not agree with the military action, there certainly were national grievances demanding rectification. "He eventually signed a resignation letter, which was drafted by the Attorney-General (Mr Prince Machaya) in the presence of (then Justice Minister Happyton) Bonyongwe. So tell me, is that a coup? Does a coup incorporate impeachment? Does it enlist the Central Committee of the party that has provided the President who people want out? Does it involve a demonstrations by people from across the political divide?"